Man… feels good to be back :) A little weird posting up a net worth update when the next month is half-way over, but hey – can’t break my record of 107 in a row now, right? And interestingly enough, these were the only requests that some of you asked me to do when I was away on sabbatical. Okay, here’s the TL;DR version of last month: Trump won the nomination. The markets freaked out and crashed over night. The next morning it rebounded and mysteriously got supercharged (???). This bumped up all our gains for the month. And then I paid off more of our car loan, didn’t lose any cash savings (a miracle since I didn’t pay attention to our money at all last month! ), and the wife’s TSP continued to go up through consistent contributions. CASH SAVINGS (+$14.38): I’ll take it!!! This whole last year our savings stash went from like $30,000 down to $4,000 (through a series of fortunate and unfortunate events), so lately anything that’s in the green feels like a major win around here :) Especially taking an entire month off and not concentrating on earning anything, but *growing* my projects instead. And of course soon we’ll have that stash hitting our accounts as well from last month’s announcement of building a team here at BudgetsAreSexy and selling a minority stake in it (stay tuned for next month’s update which will show that). BROKERAGE (+$22.66): A nice little bump here, mainly from my continued use of Acorns which rounds up all my daily transactions and dumps the change into investments for me. It doesn’t seem like much over the months, but then when you look at the whole pie you see it’s almost $550 which is awesome! Literally from spare change! THRIFT SAVINGS PLAN (TSP) (+$434.59): I say this every month, but it’s always so fun to watch the drastic climb of an account when you start building up from scratch :) Which is exactly what’s going on here with my wife’s TSP account from the gov’t job she landed in late Summer. Every paycheck it automatically adds in another chunk, and we don’t even notice it at all since we’re so used to seeing the lesser amounts. If you’re not contributing anything to your retirement accounts, I urge you to please start now! Bump it up even just 1% and you’ll get used to it as well (and even maybe get addicted, since most employers will match it and give you FREE MONEY just for doing so!). ROTH IRAs (+$4,307.14): Easy money! Haven’t dropped in a penny for the last 6 months and it continues to creep up over time.. That’s the power of *investing* your money vs just keeping it in savings (though that has its place too). I hope to go back to monthly contributions one day, but for now we continue to max it out in one chunk at the end of each tax year so long as we have the money for it. I still don’t have this “self-employment” thing down even though it’s been half a decade (probably because I keep changing up the game :)). Lastly, here’s a look at how our money has performed over the past year! As long as it keeps trending up I’m okay with it :) I was telling a friend the other day that I used to grow it SO MUCH FASTER back in the day, but for whatever reason I’ve had a much harder time with it these past 3-4 years. She asked me how old my boys were, and when I said 2 and 4 we both let out an “Ahhhhh” at the same time as the epiphany struck us, haha… damn kids! How was your month? How’s your month going this month? As always, you can see all 100+ of our net worth reports over the years here, and once you’re bored with those you can head over to my sister site, , and check out 200+ OTHER bloggers’ net worths as well. Hope Santa brings you more wealth this holiday season! NICE!!!! So smart!!! We didn’t have the balls to go w/ an HSA/high deductible cuz of our kids, but I’m hoping one day we do :) Especially if indexes are available in them – best of both worlds! I’ve got 4 kids and did the HSA $3k deductible silver level plan with carefirst. But my options are crap compared to yours with gov’t. You definitely end up spending the $3k but the other $3750 is their for investing, assuming you would max out. I’ve heard of those!! Haven’t dug into, but I swear a couple of financial bloggers are rocking ’em. Stock market had a great month and continues to do so in December! Gotta love it. The psychological effect of these really good months make forget the bad ones… But they come and go. So long as the trendline is going up though! I’ve been waiting all year for my HSA account balance to break the $2,500 minimum that Fidelity requires before you can put it into a mutual fund but todays the day. I finally get to drop my HSA into the market and let it start making me something. But I haven’t quite figured out which fund to use yet cause I’m not as familiar with the Fidelity options as I am with the Vanguard options. A beautiful position to be in though! I hear great things about Fidelity so I’m sure your options are pretty good. 22k increase without any work – yes please. Hard to believe that swing from election night to now. Some traders got their butts kicked on that one. We are going to be pulling numbers in a few weeks – at this rate everything should look good. Looking good. Just goes to show you, you never really know what the market is going to do. I think people feared a Trump win meant bad things for the market. Just need to keep thinking long term. I too see no issue with a small amount of debt as long as it is used strategically. I did have a sizable student loan debt coming out of college, but I paid it off in the first two years of work. As such I guess it didn’t leave scars that would drive me to abhor debt. However I see this view of debt everywhere for those who are. It is the same with things like credit cards. I had a conversation with a friend who is visiting us this week about using signup bonuses to make money on the side. We make a few k a year through this stuff. However his response was that the credit cards would lead them to a bad position due to lack of self control and it would do so to most of the population. He is right of course. But because I never had a spending addiction, even if there were times in my life where I was not exactly frugal, it not something I fear. Awww yeah, work it girl! This Trump rally has been a sight to behold. I’m up about 14 since November myself. Of course I’m not all in VTSAX. I’ve got a small bond allocation and some international as well. Got to figure they are due soon, they’ve been getting hammered for so long. I’ve been hearing people say get into REITS which idk, If you have Total stock market REITS should be in there anyway and who knows what the lending environment will look like in the next 4 years. REITS are so highly leveraged to make their dividends that they scare me a little. VTSAX/VTSMX doesn’t hold REITS. It holds basically anything that’s classified as a “corporation”. 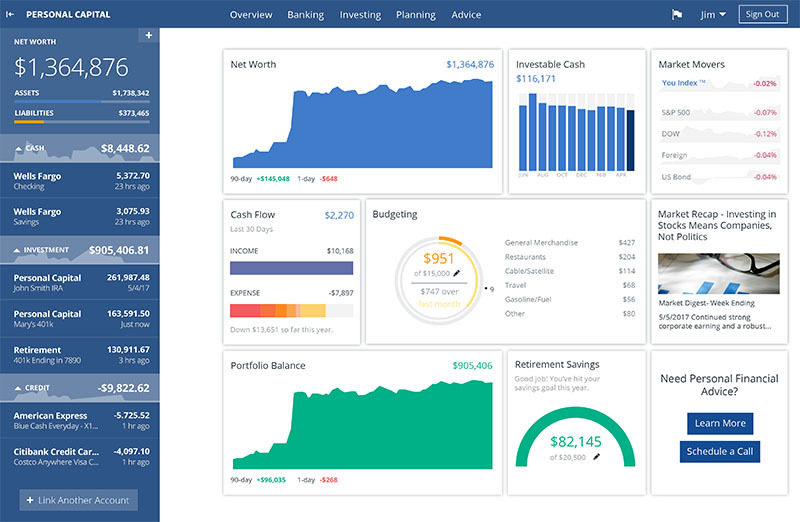 You can see what’s in a Vanguard fund when you go to that fund’s page, and click on “Portfolio and Management” towards the top. That page will give you a broad overview of what’s in the fund. But if you really want to delve into it, there’s a link lower in that section that says “Portfolio Holdings”. That will give you every single stock/position that’s in the fund. All that being said, Vanguard does have a REIT index fund. And as you alluded to, because they have to pay out much of their profits in dividends, they tend to have higher yields than the broader market. Well the asset classification shows a 3.8% holding in Real Estate. Looking at the list of investments in VTSAX there is one called Realty Income Corp.
Great month and welcome back! I love the strong market gains, I’ve had the same. The only thing that makes me nervous is that it’s that much further to crash later! Your wife is so lucky to be able to participate in the TSP. TSP is definitely one of the best run 401k type plans out there and I have been amazed how low the fees have been from the beginning. 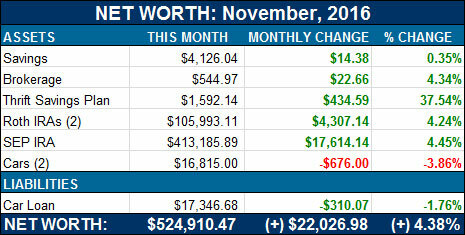 Nice November net worth J$! Not all progress is good progress, but this looks like you made good progress! I remember on election night when it was projected that the market was going to drop like a rock the next day. I spent much of that night thinking of how much cash I was going to plow into the market when it did drop. But then it didn’t — it just kept going up. Been a very nice month or so for those of us who have a lot in stocks. Haha yeah… I told my wife “Damn – if only we had like $50,000 laying around so we can scoop up a ton of stock on the cheap!” I was CERTAIN it was going to drop and give out deals to everyone – but wow. Just proves again how sucky we are at trying to time the market! Haha, I Did the same thing. Then nothing happened. Such an anticlimax. Great job working on that car loan! We still have a car loan, too. It’s funny, because the interest rate on our car is so freaking low that it makes sense to tackle all of our other debt (including our mortgage) before the car. Weird, huh? What is SEP? Is that a Traditional IRA? Because the Hitchhiker’s Guide to the Galaxy fan in me wants to translate that into Somebody Else’s Problem. I like your thoughts on debt here, J Money. We recently took out a mortgage on our previously-paid-for home in order to invest/take advantage of arbitrage, and have not really noticed dramatic feelings of worry or stress. It’s a small mortgage ($100k) so maybe that’s the reason? Anyway, the more I get into personal finance the less I feel that debt is black and white. It’s a tool that can really help build wealth, IMO. Or destroy it, of course. Yeah – anytime I go back and read older articles of mine here, especially from 2008/2009, I cringe of how black and white I used to make things. But as we all learn over time, every situation is different, and it’s even more complicated by ages and history and culture and yada yada yada. So now I catch myself saying the ol’ “It depends” lame responses, haha, just to be as accurate as possible :) But people never like hearing it cuz they want to know 100% which way is “right” so they can make a decision! I remember once coaching a financial blogger about finances (ironic?) and at one point he just stopped me on the call and said, “I know I know, we blog about this all the time. But I literally just want you to TELL ME WHAT TO DO and I will go and do it. I don’t need the background, just tell me my marching orders.” So I did, and he did it. We all work so differently! Great month, J$! We had a very, very similar month to you. I admit, even though I believe the absolute best investing strategy is buy and hold (in index funds), I was a little freaked out as I watched futures on election night. I was pleasantly surprised the next day but, I admit, I continue to wonder when it’ll fall. We still have mortgage debt and don’t plan on getting rid of it at this time. We are using that leverage to work on other investments, so it really doesn’t bother me to keep it. Just wanted to mention how inspiring these net worth updates are. 107 in a row? wow! Same as with a car… since you have a sizeable net worth, there is nothing wrong with keeping that loan for now, while you continue funding other accounts and invest. The debt/loan problem is more with the people who have no safety net and continue to fund their lifestyle with debt. Plus, you traded up… i.e. the new car and loan gave you a better opportunity for your wife to pursue her career. True that! I sometimes have to remind myself why I let go of a perfectly working (paid off) car – especially one I loved! – but at the end of the day my loved PEOPLE had to come first. And yes – totally agree w/ your situation too :) Nothing wring with some nice cash flow! It is kind of weird at a certain point, it gets hard to see the inputs you are adding to your net worth except in the macro. When individual accounts vary on a daily basis by amounts higher than you are putting in, you really have to step back and appreciate the strategic impact of those contributions, because they get swallowed up in the daily motion of that most assets do over time. That said, my wife only in the past 10 months got her 401k access, watching that balance head upwards is far more entertaining to me than the almost invisible contributions to my retirement plan (though ironically mine is a 80% more than hers). That was a good month J$, and I’m glad you didn’t break your streak. The markets are so much fun right now (might as well enjoy the highs right?). For the first two weeks of December, for the first time in our lives, our investments earned more money than we did at our jobs. That was a pretty crazy feeling. I could get used to that. “our investments earned more money than we did at our job” – SO HOT!!!! Nice work! I love checking in and seeing how much my investments and my net worth grew. My web browser history is probably dominated by Personal Capital as I check it so much… on the good days at least. November was an especially fun month to review since the markets shot up so much. Here’s hoping the hot streak continues! Great performance! I’m loving the Trump rally as well. Better enjoy it while we can because the tide can turn very quickly! Man, it is so crazy how much the markets have risen. Never would have expected it. Doing my own investment year in review and it’s been fun to see how money was allocated throughout the year. Let’s hope small business income taxes get cut in 2017! It’s always fun when the markets go up quickly. Let’s hope it continues for a while longer. Glad to see you are doing well. We a rough November. Our net worth went down. Back on track for an amazing December. Can I get a holler for my husband’s year end bonus? My long debated but finally settled contract means back pay for me this Friday! Things are looking up! Holla holla, husband! You get that money! Your net worth is looking pretty nice. It’s amazing to see your progress move with the swings and punches of the stock market each month. Jay, do you keep the FI blogger NW ranking updated? We’ll probably be implementing a newer system for it in the new year, but for now we keep going as-is! I had a very disappointing December in the stock market, maybe I’m not good in these things, will surely give a try again next year. Let’s see how things will go for me, By the way; I don’t find any problem in having a debt as long as you are using it properly. It’s really amazing to see that you have got a good amount of growth without even spending a penny. All the very best for your future mate, hope you make good amount of profits in the upcoming years. I am glad these still exist. Always fun to see these snapshots. Your net worth updates are definitely inspiring. I came across your blog about 5 years ago and started tracking my own NW for about 4 now. It’s encouraging for me to see your posts. It’s a glimpse of where I *can* get to. So thanks! Previous post: Side Hustle #68: Make Money Selling Christmas Trees! Next post: Another Way to Think About FIRE: Freedom, Intellect, Resourcefulness, Enough.